For six years, single mom Anna Noguera lived in a one-room motel with her three children. She was working to save for an apartment and furnishings, but the rent took up too large of a percentage of Anna’s gross income. “Every day, we thanked God we had a roof over our head, but we lacked stability,” Noguera said. 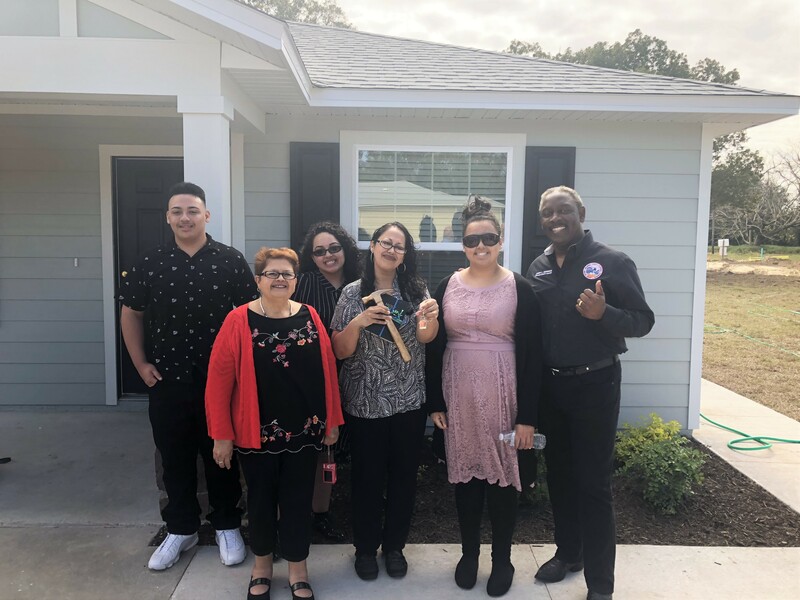 The Noguera family along with three other homeowners were recently issued the keys to their new affordable homes in Apopka, which granted them this much-needed stability. The celebration was part of the conclusion of the 2019 Builders Blitz, a partnership between Habitat for Humanity Greater Orlando & Osceola County, Orange County Government and four builders who built four new homes in Arbor Bend in South Apopka in just five days (between Feb. 4 – 8, 2019). During the celebratory presentation, Orange County Mayor Jerry L. Demings handed the house keys to four families along with their respective builder, which included K. Hovnanian Homes, Park Square Homes, PCL Construction and Pulte Homes. Mayor Demings stressed events such as these highlight the importance of public-private partnerships and he said to expect more partnerships on the horizon for Orange County. The County has given $1.6 million in total funding to help with the land acquisition and development of Arbor Bend, which will construct a total of 56 single-family homes in this area that are vital to support affordable housing initiatives. The Orange County Division of Building Safety also expedited all permitting and were onsite to move the process along. Orange County District 2 Commissioner Christine Moore, Apopka Mayor Bryan Nelson, Habitat Orlando & Osceola Board of Directors joined the dedication, which included more than 100 participants. All the Habitat homeowners are required to volunteer at least 200 hours in order to fulfill “sweat equity” to qualify for homeownership. In addition, all take more than 17 classes on homeownership. Mortgage payments will be no more than 30 percent of their annual income. The stories of the families benefiting from this unprecedented partnership are a testament to the success of Orange County’s focus on community and its commitment to finding affordable housing solutions.